A plan of the Cemetery is shown below. It is based on the OS map of 1900 (Ref 1). The circular feature in the centre of the cemetery no longer exists as the space was required for burials. Extra space has also been created at the north of the site and by doubling up plots. The plots are numbered in the registers starting with 1 at the top of the map to about 100 at the south east corner, and from A at the top of the map to R at the north west corner. These numbers and letters are shown in red in the plan below. The map has been divided into seven zones coloured orange, yellow, blue, green, red, mauve and cyan. Clicking near the centre of a coloured zone will bring up a detailed map in a popup window with the individual plots identified. 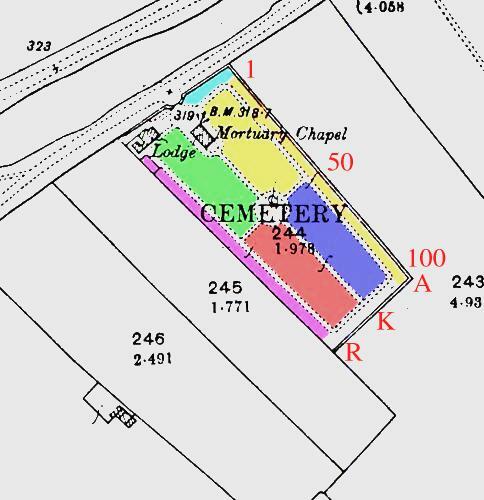 For a plan of the whole of the old part of the Cemetery (file size 507 kb) click [here] . Ordnance Survey 1900 Sheet LVI-10. Scale 1:2500 (25.344 inches to the mile). Surveyed in 1882, Revised in 1899. The detailed plan was drawn up by Barrie Denny.